The design comes with some natural advantages. When the ‘transformed’ cell is facing the sun, the strips do not cast a shadow on the others,, and since the effective aperture area remains the same, the bending of the strips should not affect its output. Once the Kirigami panels have been developed as a finished product, they would possibly weigh less, making them attractive for airborne uses. Also, as several studies have highlighted, aesthetics is quite important when it comes to rooftop installations. Thankfully, the clever design does not only generate more electricity than its flat-panel counterparts but looks more appealing as well. At this point, you are probably teeming with questions — can the cell material withstand the cyclic stretching consistently? What about temperature fluctuations (daily/seasonally)? 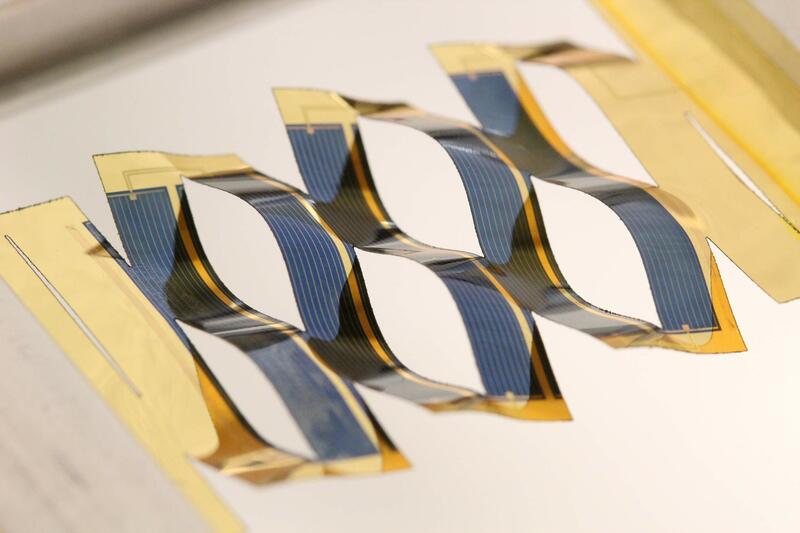 What hardware will actually be required to stretch and morph the solar cells in actual deployment? Before you jump to point out flaws with the idea, do consider that the current work has only been reported as a proof of principle. Moving towards a commercial application will take a lot more effort! To create a working product, at the minimum, the cells need to be encased in a structure which will protect them from the weather and also provide mechanical support. Additionally, electric motors will be required for the tracking mechanism to work. As per the paper published in Nature Communications journal, the authors did consider the effects of strain and cycling for long-term solar tracking by performing accelerated tests. They concluded that by optimizing the cut geometry and thus minimizing stress at the cuts, it is possible to significantly decrease strain fade. While Kapton (a space-grade plastic) was used as the substrate for current work, other materials with improved mechanical and thermal stabilities (for example, spring steel) are also being investigated as more robust materials platforms with longer operational lifetimes. Though the idea has a potential to make rooftop solar much more efficient, in the near term the researchers say that it would be more feasible for smaller aerospace applications. If you have been keeping an eye on technology updates, then you would have surely seen a number of other recent innovations using kirigami. A few weeks back, scientists at Arizona State University used kirigami to create (prototypes of) flexible batteries that can be stretched to more than 150% of their original size and still maintain full functionality. The battery was sewn into an elastic wristband that was attached to a smart watch. It could power the watch and its functions – including playing video – as the band was being stretched. Check out the video at this link. Around the same time, physicists at Cornell University took kirigami down to the nanoscale — creating them from one atom thick graphene sheets — possibly fabricating some of the smallest machines the world has ever known. More on this over here. is an Associate Fellow with The Energy and Resources Institute (TERI, New Delhi) - an independent, not-for-profit research institute that focuses on energy, environment and sustainable development. He follows the Indian solar market at @indiasolarpost. Every now and then he also writes at SolarMarket.IN. Views and opinions if any, are his own.